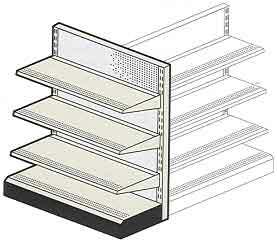 Used Store Shelving is the most practical and economical investment in a store’s presentation appeal. New store shelves may be outside of the price range of today’s retailer struggling to make even a marginal profit. The storeowner may be tempted to use the gondola store shelves already in place even if the paint is chipping and the individual shelves themselves are beginning to buckle under the weight of overstocked inventory. Used display store shelving by EasyRack.com is intended to offer these business owners an alternative to doing nothing by making it possible and affordable to invest in display racks that offer greater reliability, flexibility, and long-term investment. All units are inspected to verify a quality paint job, a straight frame that can be fitted together with other retail store shelving units, and weight capacity to ensure a stable platform for the most important products on display. 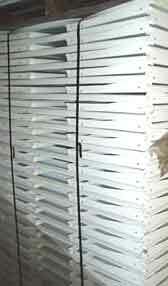 Discounts on used store shelving can be as high as 40% in certain areas of the country. Even better, the flexibility these used shelving fixtures offer to owners of any type or size of store makes one unit able to do the job of two or three competing units that are designed less efficiently and with less weight capacity per shelf. Used store shelves can hold up to 350 pounds in weight. This is very important to the store pushing larger products at Christmas time. If top shelves are too weak to support larger products, then the only alternative the stocker has is to place the items at the base of the rack. The problem with this is very obvious: people cannot see these items as well, and no doubt many sales are missed as a result. Use display shelves offer a very important competitive advantage over many competing display models. They can be adjusted to any vertical position within the display, effectively making the top shelving areas larger than the ones at the bottom. The ability to hold more weight (coupled with the very stable fixture base) prevents the shelf from buckling in the middle. One store shelf can be used for many types of product displays. Simply adjusting the height of each shelf allows for any number of product types to be rotated through the same rack over the course of the Christmas Season. Even more importantly to small store owners with limited lighting, used store shelving racks allow merchandisers to adjust the depth of individual shelves as well as the height of the shelves. This ability to vary the depth of each shelf anywhere between 12” and 22” makes it possible to get light to all portions of the display and make certain every product is clearly visible to customers. Will help you merchandise your very best and most significant products in places of prominence where they have the best opportunity of being seen by holiday shoppers. No doubt you have already set aside the hottest items on special, so maximizing your showcasing power can increase your chances of good sales even more. It’s all about space planning, arrangement, and management. Because less can be done for more when you plan first, you will not have to pay an arm and a leg store shelves—just enough to make a difference between marginal sales and profitable sales in this very problematic economy we currently face.